We are a leading Manufacturer of spline shafts from Thane, India. Being a client-centric firm, we are engaged in offering optimum quality Spline Shafts that is widely used to maximize the amount of torsional strength and contract area. Our offered shaft is manufactured by utilizing excellent quality raw materials and advanced equipment under the guidance of our deft professionals. Available in different specifications, our esteemed clients can purchase this shaft as per their preferences. 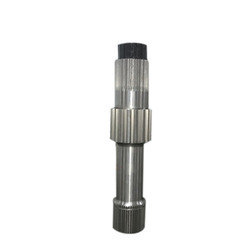 Besides, this Spline Shaft is extensively used in portable tools, textile machinery, printing machinery, geared motors and other allied products.